August 21, 2017 . Review by Editor. 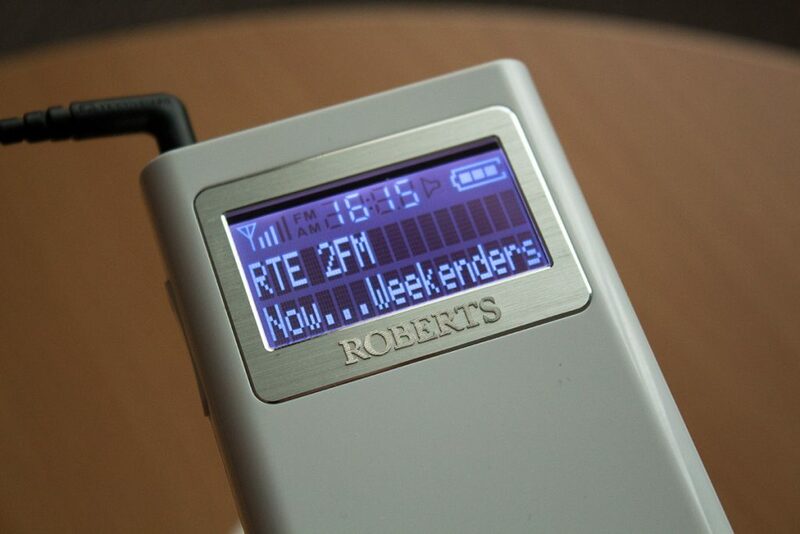 The Roberts SportsDAB5 DAB/FM personal radio offers an excellent display and well-placed buttons. Reception and sound are good, but the jog wheel can make navigating stations a little drawn out. 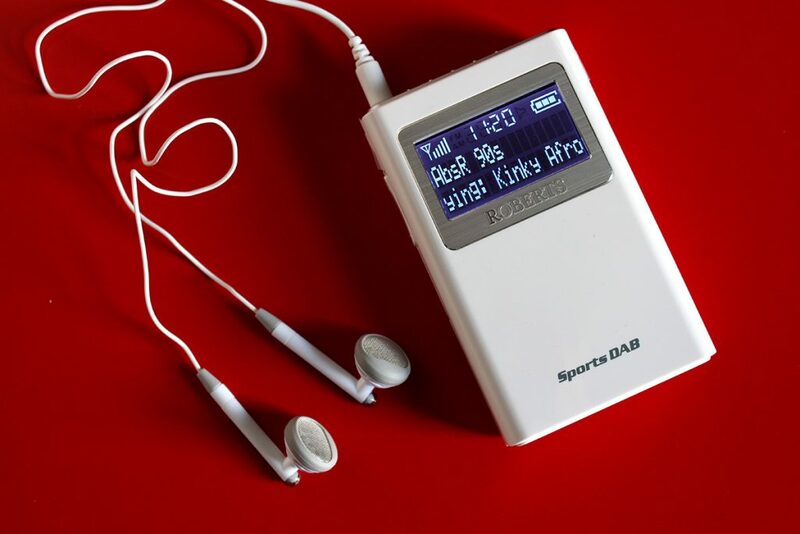 The Roberts SportsDAB5 is a personal DAB digital radio for listeners on the move. Coming in at £40 less than the Roberts SportsDAB6 it is one of the more affordable radios of its type. Although smartphones have taken over from personal MP3 players for many users, which themselves succeeded Walkman-style devices, radio ‘on the go’ remains popular. 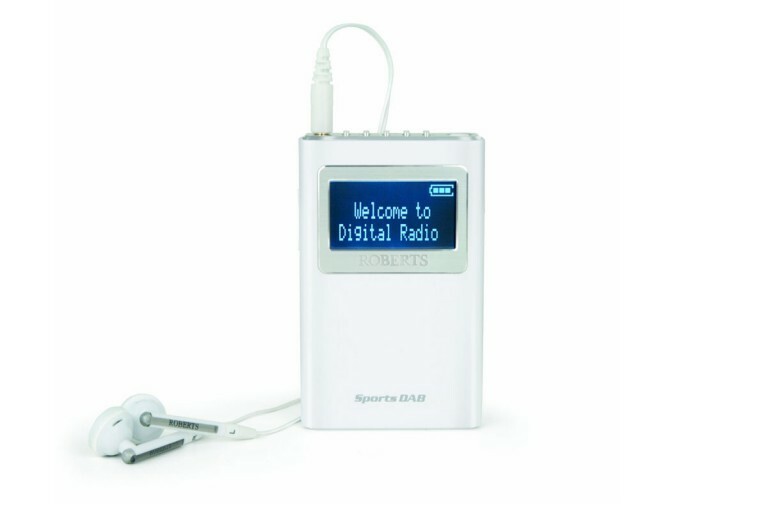 Many MP3 players and smartphones include an FM radio, but currently none include a DAB radio. Personal DAB radios like the SportsDAB5 will last through a day of sport commentary or several workouts, without the worries about using up data or dropping a £600 smartphone. On first impressions the Roberts SportsDAB5 seems very light at just 66 grams. It also feels a little plasticky. Once the AA batteries are inserted it is noticeably heavier in the hand. The radio only comes in white. The two line display occupies the front of the radio. Controls are situated on the top and sides. When the SportsDAB5 is held in the palm of your hand your thumb falls on the jog wheel. This is nudged up and down to move through the list of stations and the menu options. It is pushed in to select a station or option. The volume control is on the opposite side. A power button and preset buttons are found with the headphone output on the top. All of the buttons provide a firm, tactile response and don’t feel mushy. Turning to the rear of the radio there’s a hinged door for the batteries and a lock button. This prevents any buttons from being used unintentionally and is ideal when the radio is in a bag or pocket. The button placement means the radio could be switched off or a different preset selected when it’s in a pocket. Having the headphone socket on the top, unlike on many smartphones where it’s on the bottom, provides an extra few inches of headphone cable. Overall the design isn’t quite as sleek as it’s more expensive Roberts sibling. Given its intended use for walkers, runners or sports fans the functional layout of display and buttons is well thought out. 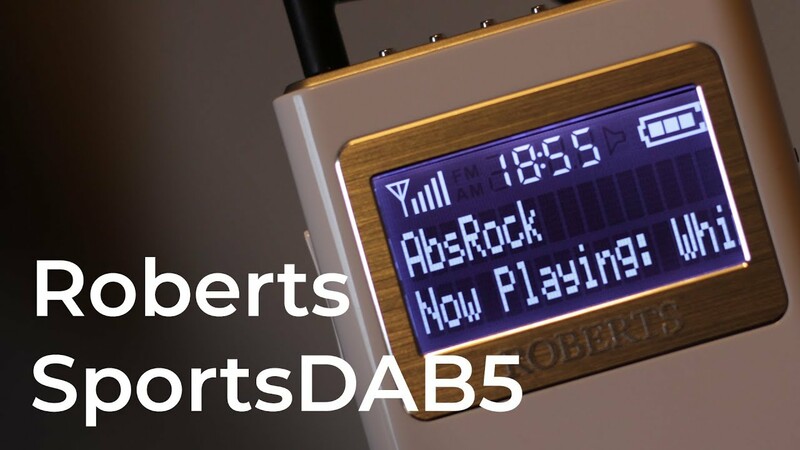 The SportsDAB5 receives DAB, DAB+ and FM radio stations. Radio stations are accessed in the separate DAB and FM modes. Five presets are available in each mode with the dedicated buttons on the top of the radio. A clear backlit LCD display shows the station name and scrolling text, as well as the time, signal level and remaining battery power. The backlight can be set to switch itself off after 12 seconds if no buttons are pressed, helping to conserve battery life. Although the backlight helps in bright light, reading text on the screen becomes difficult in the brightest sunshine. Browsing and selecting a station is achieved using the jog wheel on the right side of the radio. It takes a few minutes to get used to and works well for the most part. However, many areas of the UK now have dozens of available stations, and navigating through these can be frustrating. It’s worth setting some presets for favourite stations to make switching from Absolute 90s to Kisstory much quicker. To avoid the volume or station being changed when the radio is in a bag or pocket the keylock function can be used. This prevents any accidental button presses and is activated with a sliding switch on the back of the radio. Customisable options for the display contrast, menu/interface language, scan sensitivity and an option to prune stations are also included. The Roberts SportsDAB5 is fairly easy to use. That being said it is worth reading through the 46-page instruction booklet first to familiarise yourself with the controls and features. Power is provided with AA batteries only and there’s no option for an external power adapter. Battery life is given as 10 to 18 hours, depending on the mode and volume, when using alkaline cells. In our experience this is an accurate estimate. If the batteries go flat you’ll be able to swap them quickly and get back to listening. It may be worth investing in rechargeable AA batteries and a charger if you intend to use the radio frequently. If the audio becomes distorted or stutters this could be a sign that the batteries need changing. The battery level is shown on the display. The user manual mentions software updates which can be applied with the USB port behind the battery door. At the time of review no updates appear to be available on the Roberts website. Digital radio stations which use a high bitrate and stereo, such as Classic FM and TFM2, sound very good. Stations which use a lower bitrate and broadcast in mono are noticeable. If you’re walking or running in town or using the radio on public transport with background noise it becomes slightly less apparent. White earphones are included with the radio. These are adequate for the radio but it may be worth upgrading to in-ear or ear clip earphones if you find those more suitable. The earphones act as the radio’s antenna, so it’s important to keep the lead as vertical and straight as possible for the best reception. Volume is good and unlike some smartphones it’s not necessary to ‘max out’ the volume level to hear speech radio on the move. Using the radio in a single place offers the best reception. When walking in town (with a strong DAB signal) it was surprisingly easy to experience a loss of audio, but on a long, open beach there were no problems. Reception does seem to rely on the earphone cable being extended and vertical; this could be an issue for anyone listening to early morning sport commentaries with the radio on a bedside table. Listening to UnionJACK over a 30 minute walk we found any loss of signal sees the volume dip and return. On a similar routine with KISSTORY the familiar bubbling and break-up sound was experienced before normal audio returned. 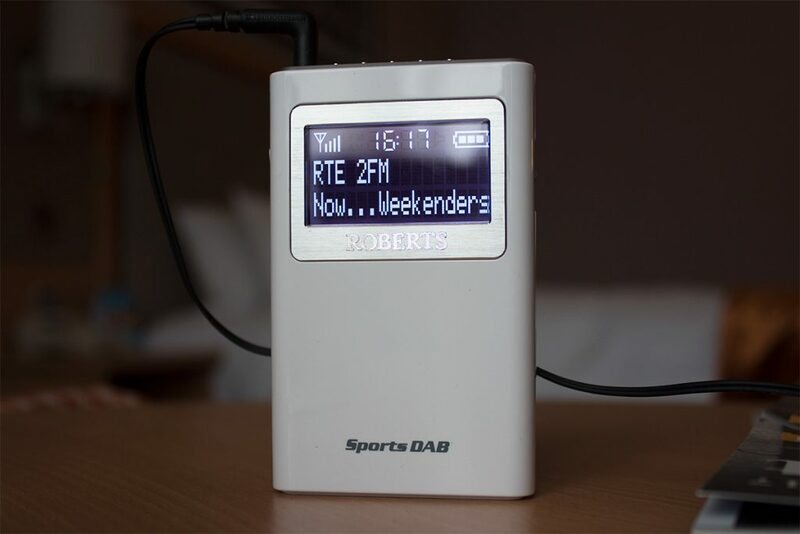 Roberts’ SportsDAB5 is a good companion whether you’re watching sport or pulling on the running shoes. Browsing stations with the jog wheel can be slow and cumbersome, especially if there are many available in your area. If you stick to a handful of sport or music stations it’s less of an issue, as these can be stored as presets. The Roberts SportsDAB5 comes in plastic packaging rather than a cardboard box, but fortunately doesn’t need attacking with scissors. Included are a set of earphones and an instruction booklet. 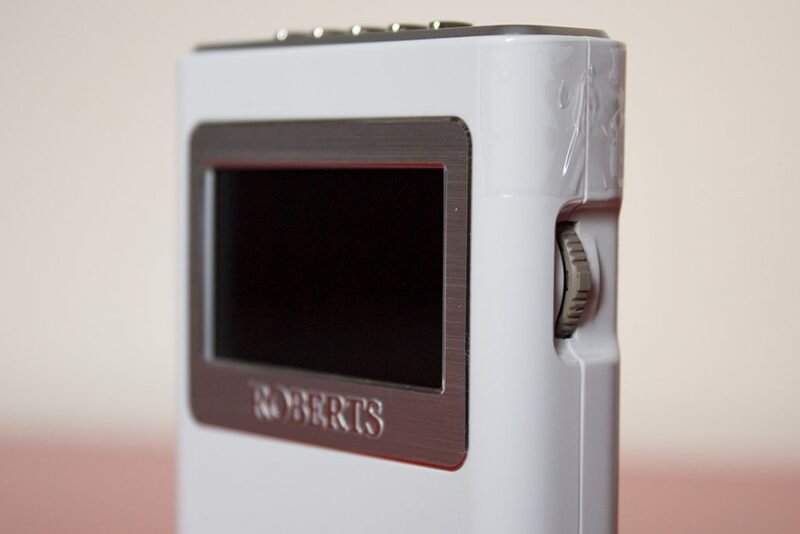 Alternatives to the SportsDAB5 include Roberts’ own SportsDAB6, which has a built-in speaker, and the Pure Move 2520. Overall the Roberts SportsDAB5 is a good choice for listeners on the move and offers reasonable value for money at the £59.99 RRP.